ENTREPRENEURS Rob and Krista Watkins are preparing to peel open a new international market for their world-leading “super food” grown and produced in the Far North. The husband and wife team invented a world-first technique to process green banana flour and say their product is the highest resistance starch in the world. Mr Watkins said green banana flour as a supplement was a high-protein, high-fibre product that could be used in cooking, drinks, or even sprinkled on cereal. “There’s not another supplement like this in the world,” he said. 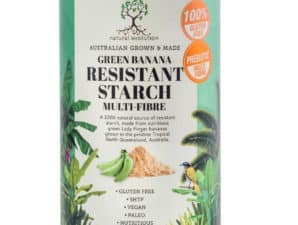 Green banana flour has been used globally as a gluten free replacement to wheat flours and, in places such as Africa and Jamaica, as a cheaper alternative to conventional flours. Mr Watkins said because the bananas were still green they contained no sugar, meaning they were “technically a vegetable”. The Watkins’ Natural Evolution company is the only source of the powder in Australia.